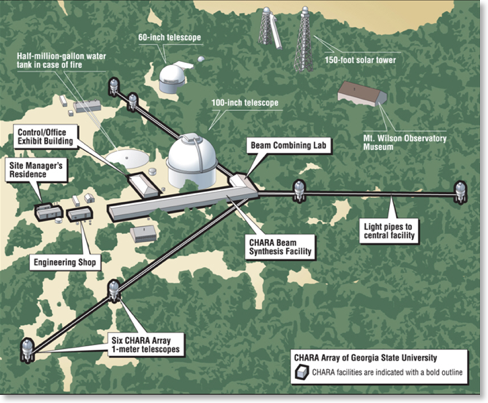 Among optical stellar interferometers, the CHARA Array located at Mt Wilson in California offers the potential of very long baselines (up to 330m) and the prospect of coupling multiple beam combiners. 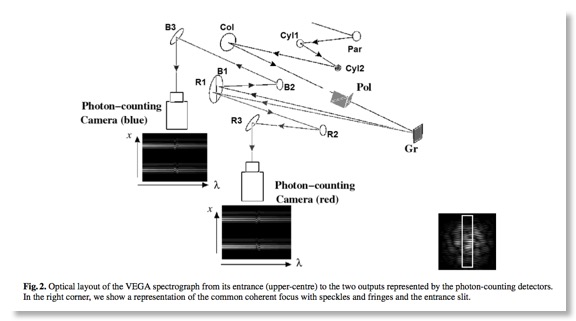 This paper presents the principle and the measured performance of VEGA, Visible spEctroGraph and polArimeter installed in September 2007 at the coherent focus of the array. 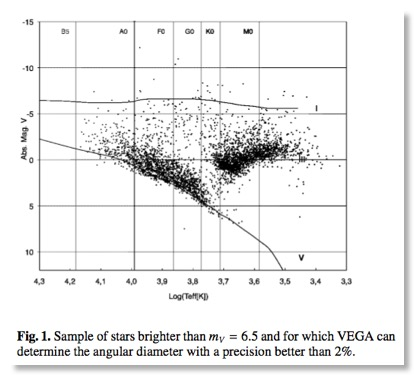 With 0.3 millisecond of arc of spatial resolution and up to 30000 of spectral resolution, VEGA intends to measure fundamental parameters of stars, to study stellar activities and to image and analyze circumstellar environments. 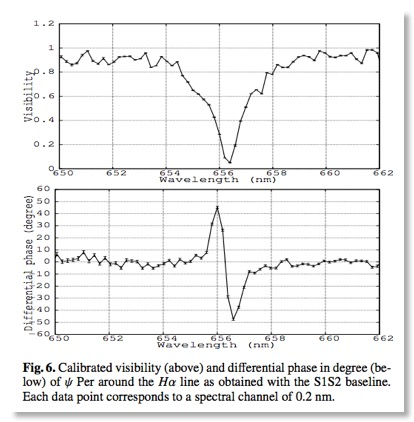 We describe the observing modes that have been implemented for this spectro-polarimeter and show actual performances measured on the sky during the first observing runs. The astrophysical programs are described in relation to the observing modes of the instrument, the presentation of the spectrograph and of the interface table is shown and finally the data is presented. We discuss the perspectives of further development in the framework of the CHARA Array. 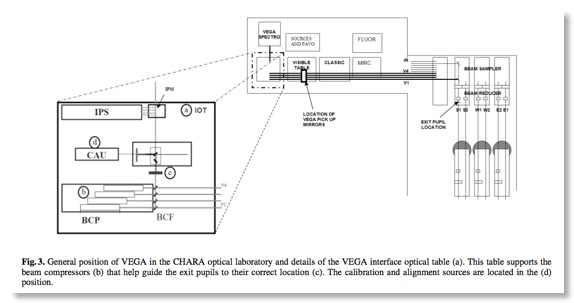 We show that VEGA/CHARA is fully operational. The current limiting magnitude is nearly 7 but the results depend on the observing conditions (seeing, spectral resolution, etc). We have validated the stability of the instrumental visibility at the level of 1 to 2% over half an hour and of the instrumental polarization for various declinations. Some examples of squared visibility and differential visibility are presented. 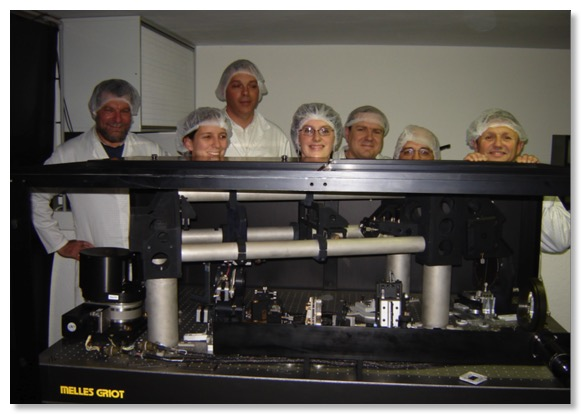 The spectro-polarimeter VEGA has been installed and successfully tested on CHARA. It will permit stellar physics studies at unprecedented spectral and spatial resolutions. CHARA meeting on Massive Stars 2009, march 19-20 @ Nice Observatory. 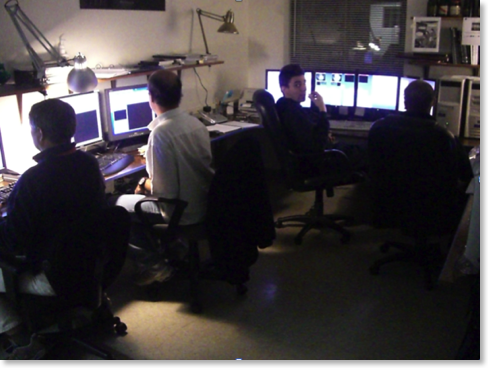 The VEGA focal instrument with part of the OCA dream team during tests in Grasse (France). From left to right: Daniel, Karine, François, Aurélie, Alain, Denis and Jean-Michel. A view of the control room @ Mt Wilson. One of the main challenges of optical stellar interferometers is to increase the number of telescopes in the recombining unit to provide a larger number of measurements and an improved imaging capability. The need to at the same time keep the important spectroscopic capabilities leads to complex recombining schemes that may limit further development. This paper aims at describing the possibilities of combining the spatial and spectral encoding of fringes for the design of more compact beam combiners and for minimizing the number of pixels that must be read. 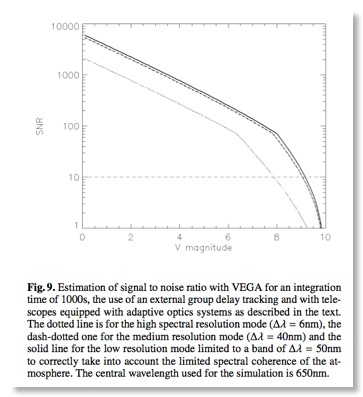 In this paper we establish the formalism of the spatio-spectral fringe encoding, discuss general applications and describe an actual implementation in the 3T/4T observing mode of the VEGA (Visible spEctroGraph and polArimeter) instrument installed at the coherent focus of the CHARA Array located on Mt Wilson in California. We finally present the science cases made possible by this instrumental implementation in the case of VEGA/CHARA. We demonstrate the interest of implementing an optimized spatio-spectral encoding of fringes in a multi-telescope beam combiner. 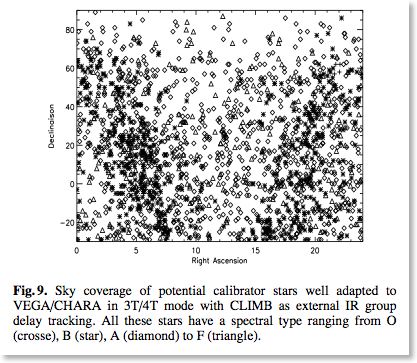 On-sky results, obtained with the 3T mode of the VEGA combiner are presented. 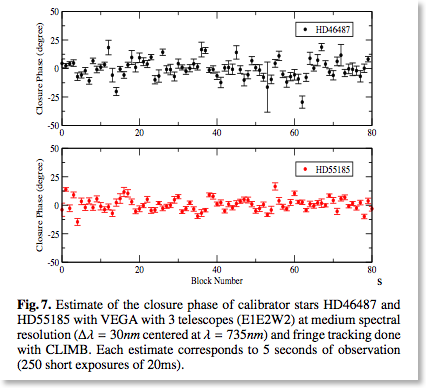 At visible wavelengths and with the hectometric baselines of CHARA, sub-mas stellar diameters could be determined with a precision of a few percent with a spectral resolution of 5000. Our first estimates of closure phase show that accuracies better than 1 degree can be achieved. 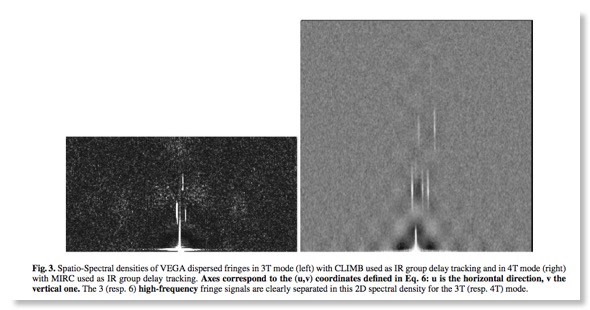 The first on-sky results obtained with the 3T-4T VEGA instrument using spatio-spectral fringe encoding show the validity of using this principle in the design of future complex beam combiners.